The animal health industry is a master of innovation. The animal health industry invests millions of dollars each year to bring only 3-4 new products to the Canadian marketplace each year. Veterinary Science was “born” in 1761 with the opening of the first veterinary school in Lyon, France. 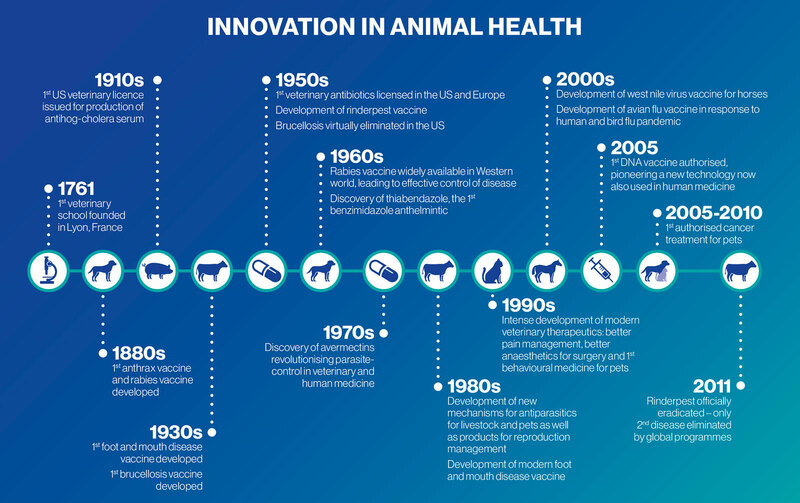 This timeline, developed by CAHI’s international affiliate HealthforAnimals provides an overview of the numerous breakthroughs that have marked the history of animal health ever since. Here are some animal health innovations to give you some ‘food for thought’. Developing shoft-chews, medicated treats and topical or transdermal (on the skin) applications as a way to give medication to dogs and cats, rather than pills. DNA studies of papilloma virus in cattle and horses have led to the development of a vaccine to prevent cervical cancer in humans. The human disease Onchocerciasis, or river blindness, is treated using ivermectin, a common parasiticide used in livestock after environmental insecticides proved ineffective. In the 1880s vaccines against rabies and anthrax were developed. Without these animal health tools, thousands of human lives would be lost each year. In 2011 rinderpest, or cattle plague, was eradicated globally thanks to vaccination programs and collaboration between animal health authorities. In April 2015 the World Organization for Animal Health (OIE) convened an ad hoc group to prioritize diseases for which vaccines could reduce antimicrobial use in animals - specifically in poultry, swine and fish.